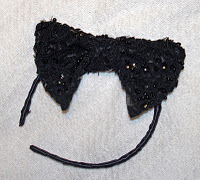 Debbie from Squiggly Twigs Designs show show to make a headband with an oversized bow. I’m loving the sequined lace fabric that she used to make the one in her example! (The fancy fabric is left over from the Christmas dress she made her daughter, so this bow will coordinate nicely.) Get the tutorial.